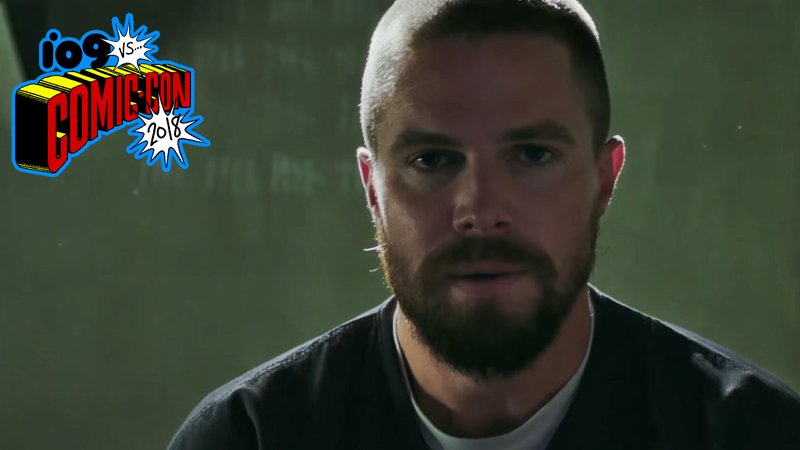 Oliver Queen is locked up (for good) in Arrow season 7. The last season of Arrow concluded with Oliver making a surprising sacrifice (especially to his poor wife Felicity)—trading immunity for the rest of Team Arrow for publicly revealing that he really is the Green Arrow and a lifetime in jail. Now, we’ve got a look at how the team will move on without Oliver... for now at least. Just dropped at San Diego Comic-Con, the trailer gives us an early look at what Arrow season seven will open with: a miserable Ollie behind bars, and an equally miserable Team Arrow wondering just how the hell they’re going to cope in a possible future where Oliver has hung up his bow for good. And there’s also Ricardo Diaz plans to take the rest of Ollie’s life from him! Not his actual life, though—that’s up to Oliver’s fellow inmates at Slabside, some of whom are a few familiar faces he already put behind bars as Star City’s finest vigilante. Oh dear. At least the prison buzzcut and beard suit him? Arrow returns later this year. Colton Haynes Is Returning to Arrow, Which Seems Odd, Doesn&apos;t It?